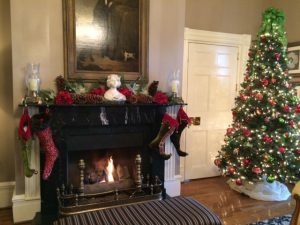 Beautiful Christmas decorations adorned the Martha Washington Inn. The first month of the new year is a fresh start for everyone. We all begin at the January starting line together. Many of us work on our company’s strategic plans over the holidays and prepare for what lies ahead. But how many take the time to create a strategic plan with their spouses and families? Four years ago my husband and I sat down for the first time in our then 16-year old marriage and wrote down a plan for the future. We have literally checked off the “action items” we created in that meeting one by one over the ensuing years. 1- “Begin with the End in Mind.” That famous Stephen Covey statement is a great place to start. Decide on a family mission statement and work backward from there OR work until you come up with your family mission statement as we did during our first meeting several years ago. That gave us a starting point for this meeting. 3- Ditch the Devices: Take calendars, notepads (the kind with paper) and pens or pencils. We turned off our mobile devices during our meeting and just focused on one another. We manually wrote down the tasks and goals for 2015 and beyond. We wanted to focus on each other and not on our screens. 4- Follow up: Be sure to turn the notes into an easy to reference “action item” list to refer to throughout the year. Post that list in a prominent place in the kitchen where you’re bound to see it. Then check-off items as you complete them. 5- Share with your children: Include your children in some portion of the planning process if they are old enough. Our “tween” has great insights and unique points of view (particularly about family vacation planning). When we returned from our “getaway” we shared some of our discussions with our son to get both his input and his ideas to make the 2015 Miller family plan even better. Have you created a strategic plan for your family? If so what tips would you add? First, I LOVE that inn. <3 Great choice! Great idea! I helped my parents do something similar several years ago, right (as it turned out) before my dad became terminally ill. I have gotten an enormous amount of comfort knowing, from those conversations, that he, in particular, did not have anything major left undone from his life list. I am also glad that they knew that, too. That is really funny Katherine that famous stars do the same thing! I appreciate you posting that link. Frankly it works for anyone and helps families. So glad your parents were abel to do this. Thanks Trudy. Glad you found the ideas useful. Great tips Mel! I love that you turned it into your own personal mini-retreat, as well. Thanks Tiffany. Well, you might as well have some fun, right? I absolutely LOVE this! I can’t believe this is the first time it has ever entered my realm of consciousness. What a great idea!! A family plan. So busy planning business, that I never thought to sit down with my family and plan out what we’d like to do together. Thank you for shining the light on this!! Jessica, as part of this family plan, and at a more micro level, my husband and I sit down each Sunday to plan out the week. It is very helpful and actually makes for a much flamer week. What a lovely idea to apply this principle to your life as a couple. You are right we all begin at the January starting line together but without taking time out to plan the steps together we may end up heading down different paths. Enjoy the fruits of your labour. Heidi, it’s been amazing how often we have already referred back to the plan and it’s just a few weeks old. It definitely gives us a road map!